Few animals can be as messy to have in your property as raccoons. These little invaders can pose a big problem for your house, your pets and all of your outdoors equipment, seeing as they tend to squirm their way into impossible places in search for food. 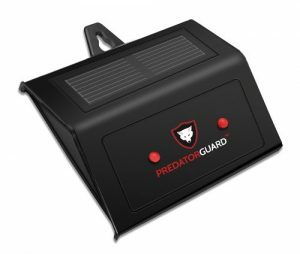 Fortunately, getting rid of these animals in a way that is safe – and legal – for everybody involved can be easily achieved by getting a raccoon trap, which will cage the creature and keep it securely inside until you call pest control or take out into their natural habitat yourself. Read on to discover the basics of what it means to have a raccoon living in your home and which type will end up being the best raccoon trap to fix your wild little problem. Raccoons are widely known for carrying rabies and other dangerous diseases like roundworm and salmonella, which are found in their feces and can be extremely risky when ingested or even inhaled. These animals are famous for looking for food in the trash, breaking garbage bags and overturning trash bins during the night, which leads to contamination, polluting and odor that contribute to unhealthy conditions. In order to make their lairs, raccoons can destroy part of your house, backyard or garden, causing serious damage that, in time, can pose serious risks to the infrastructure of your home. Raccoons are wild animals with sharp teeth and claws, and can be very dangerous to your pets, especially if they sleep outside. Domestic animals are at the forefront of a raccoon attack, and are the main recipients of any diseases they might introduce into your home. How do I know there’s a raccoon living in my house? Broken floorboards and walls, chewed off beams and scratched paint are some of the most common damages that will let you know a raccoon or any type of wildlife has taken residence with you. Littered garbage, ripped trash bags, food scraps, and damaged plants are all signs of a hungry raccoon looking for food. If you have pets, look for unfamiliar feces and fur in your yard or wherever you think a raccoon may be living. Be careful when cleaning it up, though; feces carry dangerous bacteria that can be inhaled, so make sure you use gloves and a mask. 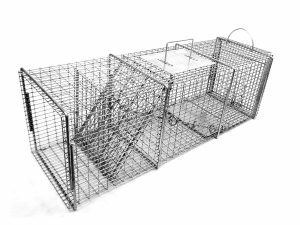 Getting rid of a raccoon doesn’t need to involve calling pest and wildlife control, especially when you can safely and legally do it by yourself with the help of a raccoon trap, which you can easily buy online and set up in your own house. These contraptions come in all forms and sizes, and work by trapping the animal as soon as they walk inside, led by the smell of whatever you choose to use as bait. Keep in mind that while these traps are one of the safest ways to get rid of these types of animals, you should always check your state’s regulations regarding the handling of wildlife. What is the best raccoon trap to use? Information is key to finding the right cage, and choosing one also depends on the animal protection laws that can vary from state to state. 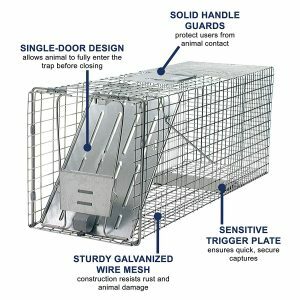 A safe and surefire way to catch a raccoon is by using a live trap; this type of raccoon trap comes in a wide variety of presentations, and we recommend choosing one with double doors for better chance of the animal walking into it, making sure that it also comes with tight mesh to prevent the raccoon from reaching out and harming you. Preventing raccoons from taking residence in your home is paramount to getting rid of them for good, so make sure to keep all types of garbage and potential food away from any easily accessed places like open garages and front porches, and always remember that if you want to ensure both you and the animal’s safety, then a raccoon trap that best adapts to your needs is the way to go.